BFREE offers content specific study abroad experiences called “field courses.” Designed in collaboration with the school instructor, these courses range in length from one week to three weeks and are structured to encourage participants to actively engage with and appreciate their natural environment. Learn about “Birds, Chocolates, Forests” a new field course offering in 2017! 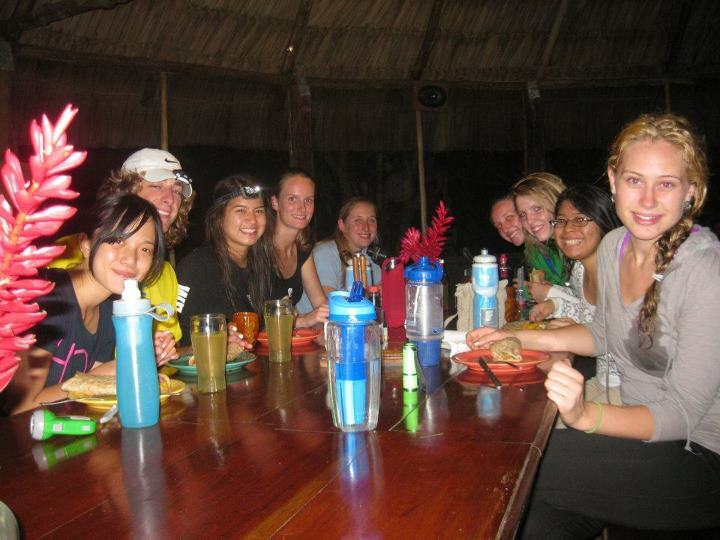 Courses are geared toward high school and college students and may be tailored to incorporate a home-stay experience in local a Maya, Garifuna, or Creole village, a community service project, and/or a visit to one of the many magical places throughout Belize, including the Belize Zoo, ancient Mayan ruins, national parks, the barrier reef, islands and coastal beaches. 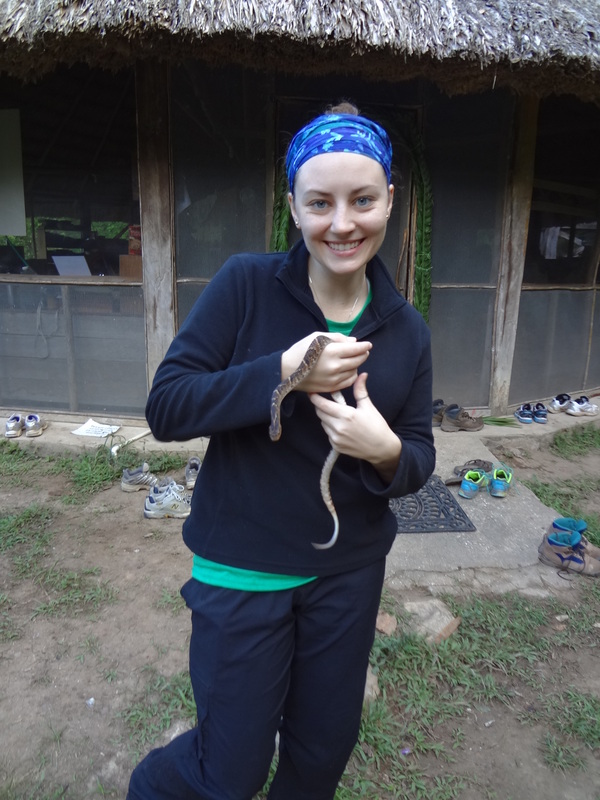 Students take part in hands-on investigations of Belize’s diverse tropical ecosystems. 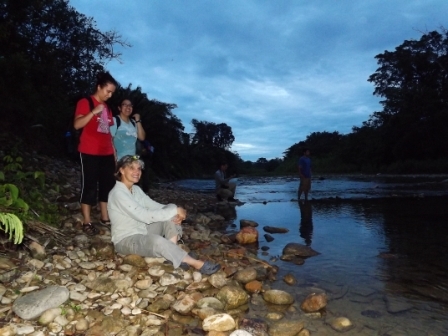 BFREE field courses create opportunities for students to become familiar with the scientific investigation of flora and fauna, while also learning about tropical riparian systems, protected areas management, and the manner in which humans interact with these ecosystems. Breakfast then travel by bus to Belmopan, the capital city of Belize. Stop by the local market where you will be immersed in Belizean culture as you assist staff in the purchase of fruits and vegetables for your stay at BFREE. You’ll experience new and delicious tropical fruits and amazing fresh juices before heading south down the stunning Hummingbird Highway and stopping by Ms. Bertha’s Tamale Stand for lunch. Continue your journey on the Southern Highway, arriving at the entrance road to BFREE at approximately 2:30 pm. Load your gear into a BFREE vehicle, fill your water bottle and apply sunscreen as you prepare for the 6 mile hike to the field station taking you through several distinct habitats (guided by BFREE staff) as you experience an explosion of sights, sounds and smells of the tropics. Settle into the bunkhouse and then dinner at 6:30 pm. Circle up to review plans for the coming days. Breakfast at 7:30 pm followed by BFREE orientation, including health and safety and tour of the facilities. Lunch at noon followed by a presentation a river walk/swim downstream to examine the impacts to the watershed. Spend the rest of the afternoon observing and writing down questions that interest you in preparation for your mini-research projects. Dinner at 6:30 pm. After dinner, view “Wings of Hope” the BFREE documentary film about the rediscovery of the wild Harpy Eagle in Belize followed by Q&A. Break into groups to participate in a night walk to search for wildlife. Early morning birding (optional) followed by breakfast at 7:30. After breakfast, visit the cacao and coffee agroforest to learn about growing chocolate under the shade of the forest. Lunch then a tour of the Hicatee Conservation and Research Center (HCRC), captive breeding facility for the Hicatee, a critically endangered river turtle. Meet at the Cool Spot at 2pm to discuss mini-research projects. The rest of the afternoon is spent focused on project work. Dinner at 6:30 pm followed by insect observations at the black light station. Early morning birding followed by breakfast at 7:30. Receive a presentation about Tropical Rainforests immediately followed by jungle hike on the BFREE boundary line trail. You’ll have the opportunity to have a leisurely picnic lunch along the way. Return to BFREE in the early afternoon in order to work on independent projects. 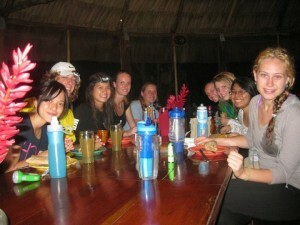 After dinner, optional night hike to search for wildlife. Breakfast at 7:30. Spend the morning completing your mini-project work. Lunch will be at noon followed by free time to hike to observation tower, bird watch at the Agami Lagoon, or enjoy a cool swim in the Bladen River. Meet at 3 PM to begin presentation of project results. Dinner at 6:30 PM followed by a Jungle Costume Party – you’ll make your own costume! Breakfast will be at 6:30. Prepare for transport out of BFREE along with gear. Travel to the seaside village of Mango Creek where you will board the Hokey Pokey water taxi for a 10 minute ride to the beach town of Placencia. Settle into rooms at a local hotel. Lunch at a local restaurant. Then gear up for a snorkel trip out to Laughing Bird Caye Marine Reserve. Look for manatee and dolphin along the way. Learn about the issues facing coastal Belize. Dinner will be at a local restaurant. Breakfast will be at a local restaurant. Pack up and head for the Placencia Airport where you will board a local airline for a short 45 minute ride to the Belize International Airport for your flight home.